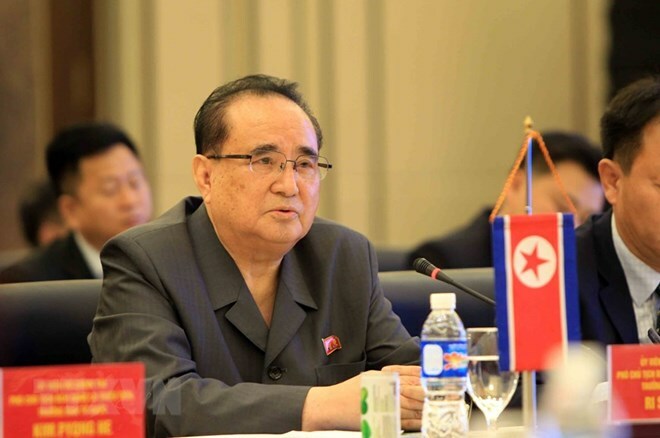 Hanoi (VNA) - Ri Su-yong, Vice Chairman of the Central Committee of the Workers' Party of the Democratic People’s Republic of Korea (DPRK) on March 28 met with Laos’ Party General Secretary and President Bounnhang Vorachith as part of his visit to the Southeast Asian nation. Bounnang Vorachith highlighted the traditional relations between the Workers’ Party and the Lao People’s Revolutionary Party (LPRP) as well as the two countries. He expressed full support for the efforts made by the Workers’ Party and the Government of the DPRK for the building of a powerful socialist country and peace and security in the Korean peninsula, Pyongyang's state media, Korean Central News Agency, reported. For his part, Ri Su-yong showed the Workers’ Party’s stance on bolstering the bilateral friendship, which was fostered by generations of leaders of the two countries, meeting requirements of the new era.